Lately, our highways in the oil field have been getting more media coverage with the increase in accidents, traffic congestion and difficulty of travel in winter weather. This topic is nothing new, but I thought I would throw together a little list of “Rules of the Road: Oil Field Edition.” Young drivers in our state have to study the Rules of the Road handbook when they prepare to take a permit test. 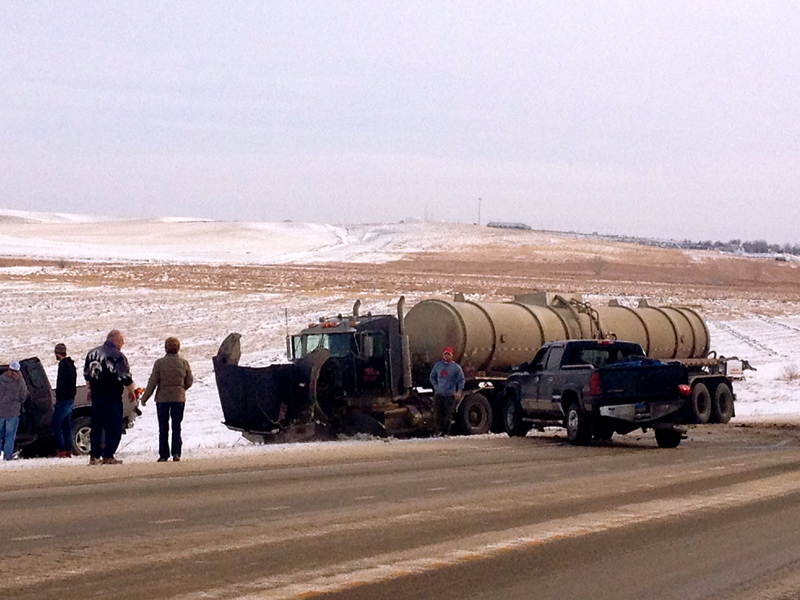 Maybe drivers should have to study a new set of rules when they move to the oil field. It doesn’t hurt to be prepared. Drive here for long, and you will probably end up with a handful of crazy stories and close calls. For example, I mentioned the pickups passing me on glare ice in my last post. Another case in point: A few Saturdays ago, I drove my little bus crammed full of speech kids to Mott, ND; and somewhere around the first crack of daylight and my 15th yawn, I watched a pickup in front of me attempt to pass a semi uphill and in fog so thick you could cut it with a knife. Of course, a pair of headlights came straight at him out of the fog, and he was forced to take the ditch. Thank goodness the oncoming vehicle didn’t take the same ditch at the same time, or they would have collided right to the left of us. These incidents have got me thinking about the changes in our previously quiet little Midwest corner. It’s not simply an issue of “traffic” like they have in larger metropolitan areas; and of course, crazy drivers exist everywhere. It’s more the issue of the traffic’s makeup. It’s the thousands of semis, pickups, and more semis crammed onto two-lane highways that were not built to accommodate them. According to a recent edition of the McKenzie County Farmer, up to 12,000 vehicles a day pass through the nearby little town of Alexander. Who could have predicted such a dramatic turn? I remember once about 12 years ago, my Grandpa Tim, an old farmer from the area, commented to me, “Boy, Rachel, I sure saw a lot of traffic this morning. It’s getting crazy around here. I counted seven vehicles on the way to town!” (He lived three miles out of Alexander.) I laughed then, but part of me wonders what he would think about the current state of his hometown if he were around to see it. 1. Avoid Left Turns Whenever Possible: Left turns are dreaded here! You might sit for half an hour waiting for your chance to break through a traffic gap. If you are forced to make a left turn on any well-traveled highway, keep one eye on your rearview mirror, lest one of the semis barreling down upon you doesn’t notice that you have stopped to turn left. Yikes. Gives me the willies every time. 2. Know the Back Roads: You never know when you might need them. Back roads have saved me hours of waiting behind accidents and traffic jams while trying to make it to work or back to my farm. Even hearing the words “back roads” gives me warm fuzzies (kind of like the words “left turn” gives me willies: see Rule #1). Do some back roads exploring even when you don’t need to. It might save you a major headache tomorrow or next week. 3. Ignore Rock Chips As Long As Possible: Rock chips WILL happen. Currently, I have 6 or 7 cracks in my windshield. But if I rushed in to replace it, another one would most likely appear within a week or two. Truthfully, your car will mostly likely not look as pretty after some time in the oil field. Besides the rock chips in your windshield, you may have rock chips and dents on the body of the vehicle, a thick layer of mud or dust that returns the day after you get a car wash, and other unsightly oil-related things. Recently, on a new semi driver’s first day on the job, he accidentally drove his tanker through town (a big no-no and a $500 fine; they are supposed to use the truck bypass), ended up stuck in the high school school parking lot, and struck and dented one of my student’s vehicles trying to turn around. This proves your vehicle may not be safe anywhere. Poor guy. Hope he found a new job by now. Really, you should not bring your new shiny vehicles to the oil field if you care about the aesthetic appeal. Although I love my little gray SUV, the good news is, I have grown up in a family who has never wasted much time or concern on the outer appearance of vehicles. My dad is a pretty well-known lawyer in Bismarck and still drives around old Buicks with the mirrors duct-taped on. I wish I had pictures of the collection of vehicles he has driven around or parked in front of our house. Once, I saw a little car sputtering blue smoke in Bismarck. I chuckled, and then when I got closer, realized it was none other than my dad driving my old high school vehicle, a Plymouth Reliant. All I could do was shake my head. The old Reliant didn’t last much longer after that. I digress, but the point is, leave your shiny vehicles at home if you want them to stay shiny. 4. Finally, Avoid Road Rage Whenever Possible: Yes, you will have bad experiences. Yes, semis will pull out in front of you; pickups will pass you only to turn a half mile later; other pickups will pass you on glare ice and uphill in the fog. It is even worse when you attempt to move farm equipment that tops out at 20 mph. Then people REALLY get mad. (I will have to write more about that later.) But as the popular slogan plastered all over the Internet these days says, just Keep Calm and Carry On. I may or may not have given in to righteous anger on the road a time or two, but it’s not worth it. All I can say is, follow a few basic guidelines to best avoid road rage: hug the white line, keep your distance, and ignore the idiots as much as you can. So there you have it. Four basic rules, but they may save your life, your sanity, or a few minutes of your time. There probably isn’t much we can do about the traffic, but we can do our parts as drivers to make the oil field a safer place. Hopefully, the state of North Dakota will continue to pitch in throughout the duration of the oil boom in an ongoing effort to improve the quality and capacity of our highways. Meanwhile, keep up the good fight out there on the highway… and wave at me if you can see me through the rock chips.